Salva was only eleven years old when rebel soldiers marched into his Sudanese village and he had to run away from them into the bush. Alone, without friends or family, Salva faced starvation, exhaustion, and hungry predators as he walked with other refugees to a refugee camp in Ethiopia. After living in the camp for several years, the camp was closed and Salva was forced to face crocodiles and gunfire as he and other refugees crossed the river back into Sudan. Then Salva led 1500 "lost boys" south in hopes of finding shelter at refugee camps in Kenya. It took them a year and a half to arrive and Salva's journey did not stop there. Based on a true story, A Long Walk to Water is a moving and fast-paced story of war, determination, and hope. I am now kicking myself for waiting so long to pick up this book. I absolutely loved it. Linda Sue Park weaves two stories together - the story of Salva's journey (starting in 1983) and the story of a modern-day Sudanese girl named Nya who spends eight hours every day walking back and forth from the pond fetching water for her family. (And that's just the rainy season - it's even worse in the dry season.) These two stories are interconnected in ways that are revealed to the reader near the end of the book. But more than that, each story is about a life-or-death journey. It's the kind of life that few American kids can imagine, but Linda Sue Park weaves a spell and brings the reader right into the story. Salva is walking to escape being forced into fighting on either side of the war. Nya is walking because there is no other way to get water. Salva's walking towards the metaphorical water and Nya's journey is more literal, but just as important. The characters drew me in, the action drew me in, and knowing that the book was based on actual events made me that much more interested in the story and in Salva's plight. This is a book that will raise childrens' consciousness and start some great discussions. While some parts of the book were fictionalized, the story is closely based on the real life of Salva Dut and he includes a note in the back of the book. Linda Sue Park also includes an author's note about her research for the story and she includes information about Salva's organization, Water for Sudan. Obviously since this is a book about war, there is some violence that happens, but the overall feel of the book is hopeful and inspiring, rather than edgy. Pair this one with Home of the Brave by Katherine Applegate or even something like Wangari's Trees of Peace by Jeanette Winter. And use it for your book discussions, buy it for your classroom... You'd better believe that I will be booktalking this one every chance I get!! Check out more reviews at Libri Dilectio, The Fourth Musketeer, The Happy Nappy Bookseller, and Presenting Lenore. 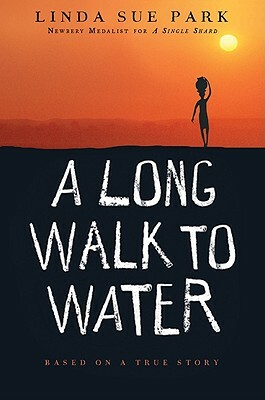 A Long Walk to Water is on shelves now!